In the summer of 2018 I travelled to Novosibirsk, Russia, to do field work in southern Siberia with Galina Azarkina of the Institute of Systematics and Ecology of Animals. Galina designed a great plan for the field work, and executed it perfectly. Joining us from the Institute were (to the Altai) Laimonas Trilikauskas and (to Tuva) Ilya Lyubechanskii and Irina Marchenko. In Tuva, Sailyk Chorgaar of the Uvs Nuur Reserve accompanied us. These colleages in the field, and our drivers Ivan and Alexei, made this trip successful and memorable for all the right reasons. These were originally posted on my personal WordPress site, starting here. From western North America, where I live, to Siberia, where I will be in one week, is only a short hop across the Bering Strait. I’ve never been to Russia. In my imagination, the landscape of Siberia is very much like that of British Columbia: hills, conifer forests, bears, wolves, deer. 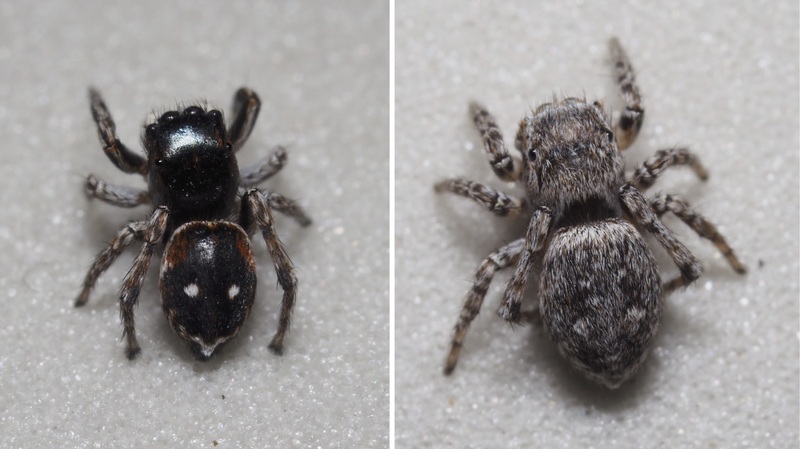 While the two areas share many species (or very closely related species), there are some notable differences in their faunas of the animals I study: jumping spiders. I’m going to Siberia to see jumping spider species I’ve never seen before. I’ll arrive to Novosibirsk, where I’ll meet up with Dr. Galina Azarkina of the Institute of Systematics and Ecology of Animals, of the Siberian Branch of the Russian Academy of Sciences, with whom I’ve planned this expedition. To be honest, she has done considerably more planning than I have, organizing much of the logistics. We will first do, as a warm up, a few days of field work near the Kazakh border (2 in the map). Then, she, I, and a few of her colleagues will travel south and southeast from Novosibirsk (1) to the Altai (3) and Tuva (4), mountainous areas along the Mongolian border. 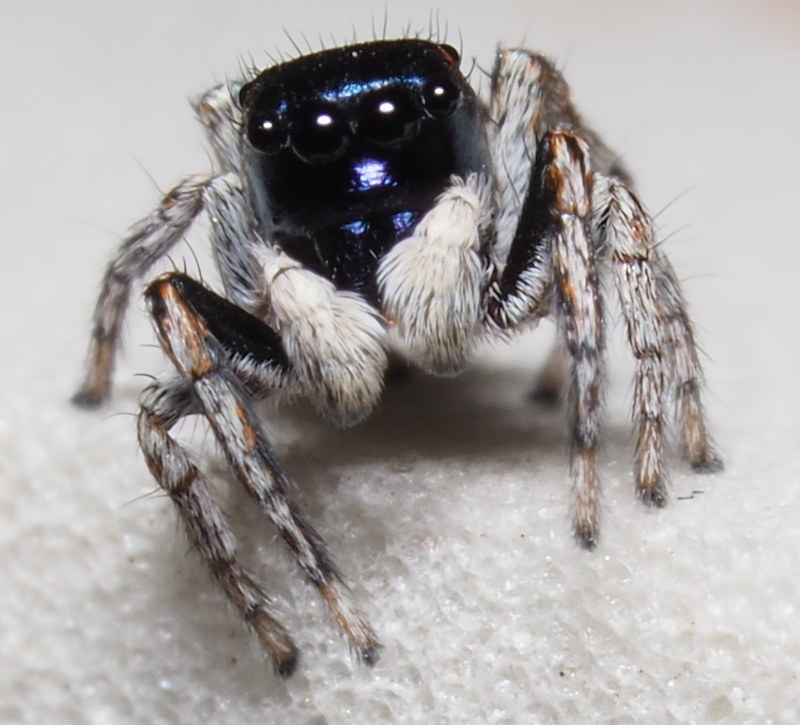 Her primary target will be aelurilline jumping spiders; mine will be Pellenes. Novosibirsk (1), and the places we’ll do field work. I’m excited about this trip. The idea of Siberian field work occurred to me only a few months ago, and yet the roots of my excitement go back to my teenage years. I’ll explain that in a subsequent post. I am already mostly packed. Ready are hand lenses, beating sheets, camera, pens, field notebooks, etc., etc., etc. — so many things. The “to do” list is still long, but my equipment and my brain are gradually getting organized. Westward ho! One of the most vividly colourful memories I carry is of two jumping spiders: a male and a female Habronattus viridipes, mating, on the leaf of a milkweed. I was 14 years old, along an abandoned road outside of Dwight, Ontario, and I was entranced. The male was stunning: yellow-green front legs with a delicate fringe of white hairs, and a third leg whose knee was enlarged into a triangular yellowish flag. I don’t think I’d ever seen spiders mating before. This, and the pink-bummed Habronattus decorus I had seen the year before, were my introductions to Habronattus, a diverse and wondrous group typically found on rocks, leaves and sticks on ground well-lit by the sun. They became a fascination of my youth. I spent so many hours scanning sunny ground for Habronattus that I can still feel the sun on my back from decades ago. 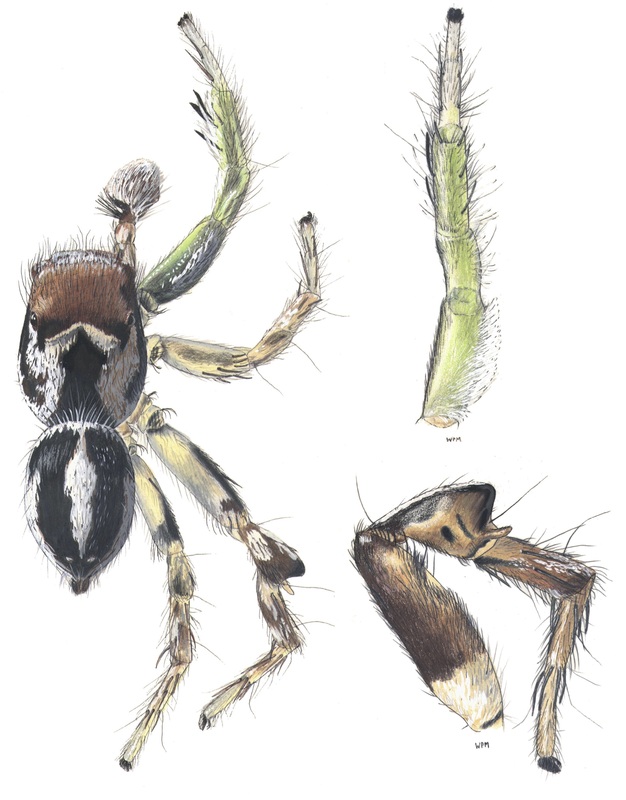 Here are drawings I did of H. viridipes several years later, with close ups of the first pair of legs (green) and the third (with the triangle). 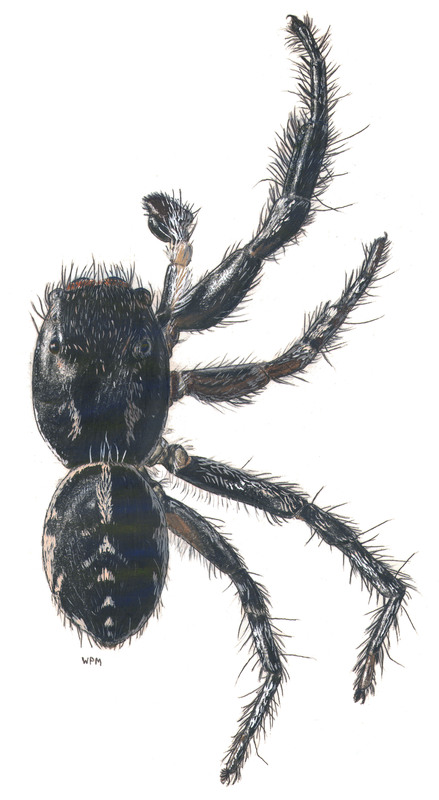 Habronattus viridipes male, drawn in 1978. Pellenes peninsularis male, drawn ca. 1978. Pellenes peninsularis brings a different set of emotions. While H. viridipes represented fantasy creatures, P. peninsularis represented family: humble, secure, predictable. David and I got to know it well, in part because the rock outcrops at Dwight were across the highway from where our father would go to catch minnows for fishing bass. 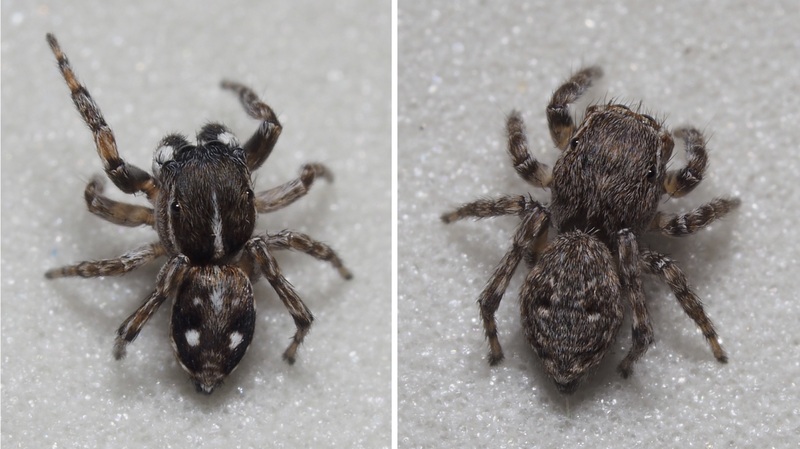 Despite the contrast in their appearance, Pellenes peninsularis and Habronattus viridipes are pretty closely related on the jumping spider evolutionary tree. Indeed, it seems that the several dozen species of Pellenes collectively form the sister group (or sister groups) to the 100 species of Habronattus. Since those early days, I’ve done a lot of research on Habronattus, but very little on Pellenes. It’s time to go back to Pellenes. 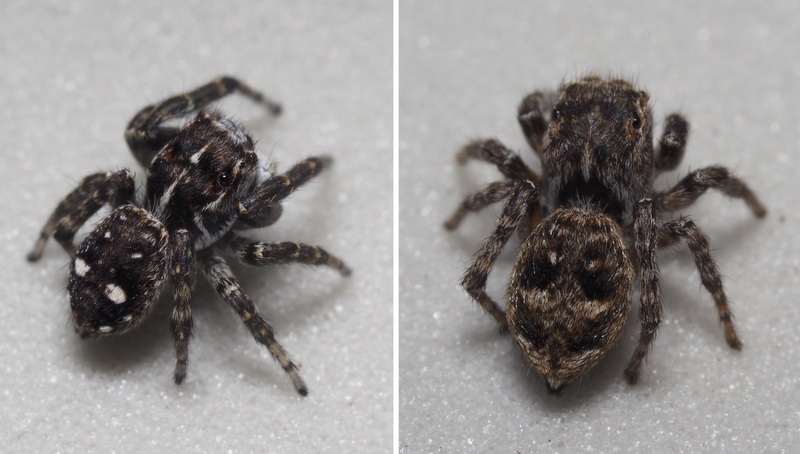 I’m now working with Marshal Hedin and Damian Elias to look in more detail at the remarkable diversification of Habronattus. To fully understand it, we need to make comparisons with their close relatives, i.e. Pellenes. While there are a few Pellenes in the Americas, most of their diversity is in Eurasia and Africa. 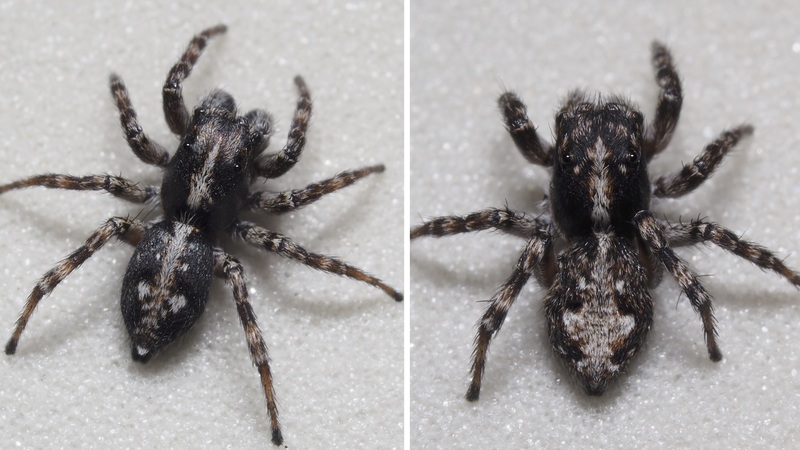 This is one of the contrasts between North America and Eurasia: the former has many Habronattus species, and few Pellenes, while the latter has many Pellenes species, and no Habronattus. And so, in going to Siberia, I will be looking in the same way as I did as a teenager — peering at sun-soaked ground on mountain sides, prairies, and forest edges, watching for tiny sunbathers on rocks or hoppers on sticks. It will be like reliving my youth, but in a parallel universe populated by a diversity of Pellenes rather than Habronattus. Why exactly am I going to Siberia? 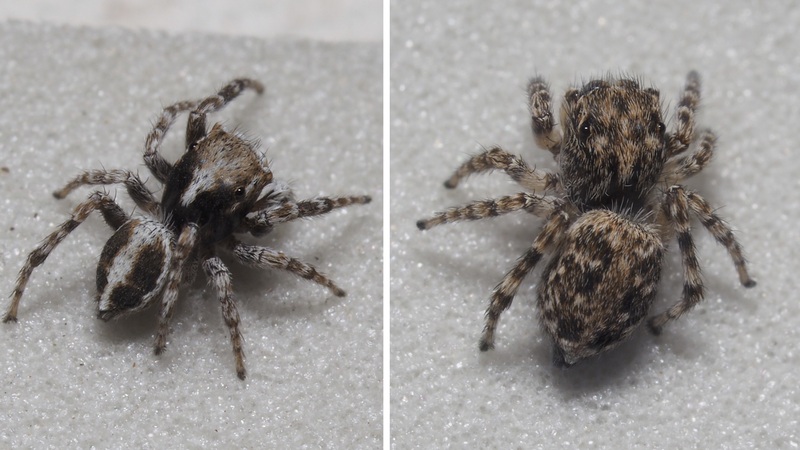 I explained in a previous post that Eurasia holds a diversity of Pellenes that’s important for me to study, for comparison with North America’s Habronattus jumping spiders. But of all the places in Eurasia, why Siberia? First, work by Russian colleagues has made the Siberian fauna known and accessible. Dmitri Logunov (now at the Manchester Museum) did extensive field work in the same region around 1990. He, Yuri Marusik, and other colleagues published several important papers on Pellenes in the central Asian region from Siberia to Iran. This gives us a solid idea of Siberia’s Pellenes species, and of precise localities we could visit. Galina Azarkina, working at the SZMN-IEIE-SB-RAS in Novosibirsk, knows the region well, though she’s focused primarily on a different group of jumping spiders, the aelurillines. Second, southern Siberia has just the right combination of species to give us key information. It has all of the basic Pellenes diversity we might find elsewhere in Eurasia, but it is also the only place to find a special target, Pellenes logunovi. As you might guess, this species was named in honour of Dmitri, by Yuri and colleagues. 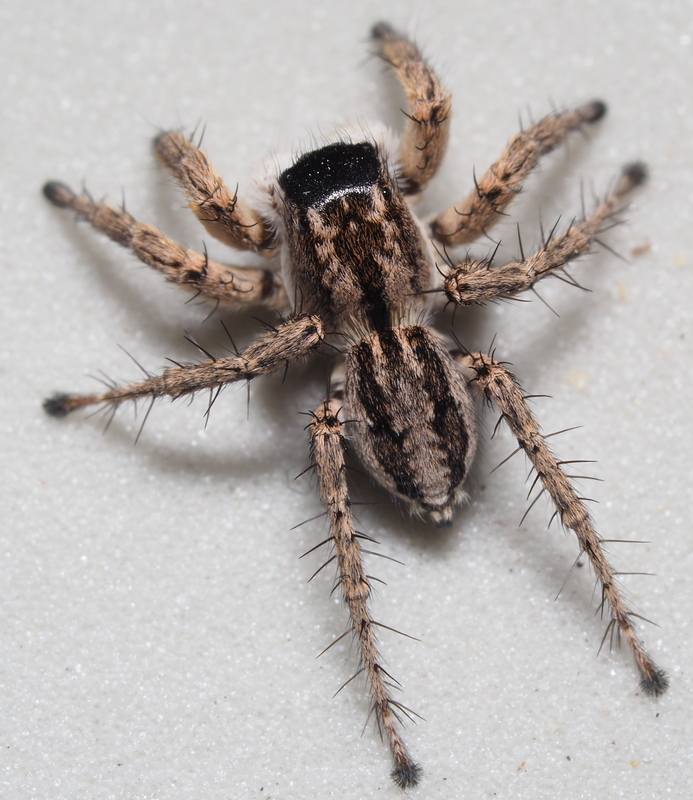 Here’s the reason that P. logunovi is so special: Among Pellenes and related genera, two groups are restricted to the Americas: the spectacular Habronattus, and a distinctive group of several Pellenes species that includes the familiar Canadian P. peninsularis. 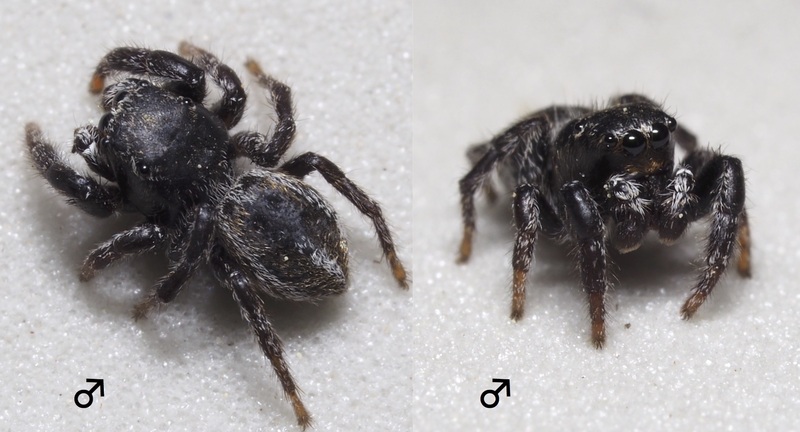 The peninsularis group and Habronattus appear very closely related, and indeed recent evidence hints that the peninsularis group might be within Habronattus. This would discombobulate our view of Habronattus evolution, and so we want to confirm or refute it. P. logunovi is unusual among Eurasian Pellenes in appearing to be very similar to the peninsularis group. If it is the closest Eurasian species to the peninsularis group and Habronattus, it could help resolve whether Habronattus has the peninsularis group within it. Several subgenera of Pellenes (Pellenes, Pelpaucus, Pellap) form a monophyletic group, the true Pellenes. 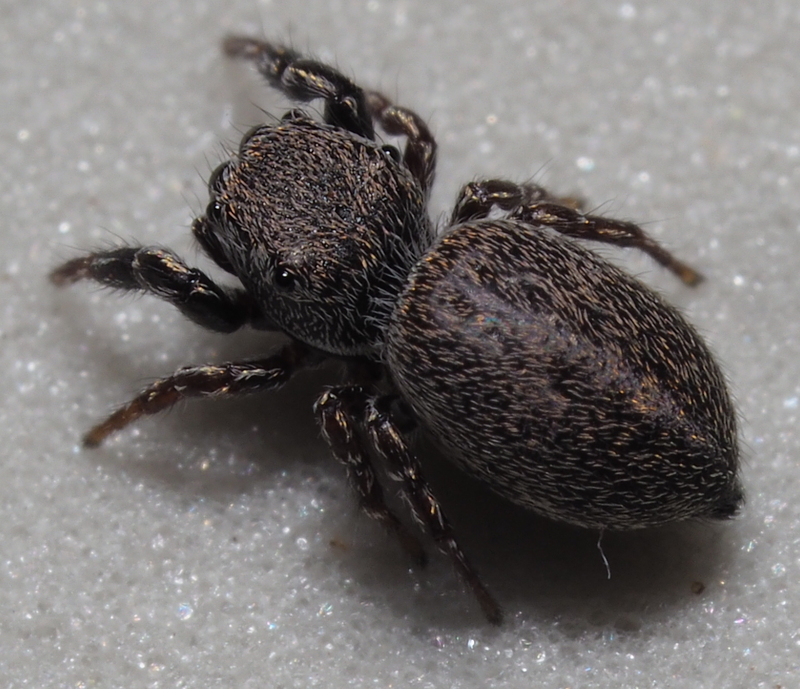 The American Pellenattus are closer to Habronattus than to Pellenes, which would likely lead to Pellenattus being to move out of Pellenes as its own genus. Havaika is the sister to Pellenattus plus Habronattus. The African Pellenes with a filamentous or absent tegular apophysis are even more distant from the true Pellenes. The Siberian specimens will not only help to test these hypotheses, but also help place other subgroups of Pellenes (Pelmultus, Pelmirus). This will leave only a few pieces of the puzzle to get, most importantly Neaetha and similar genera with a very long third leg. As I write this I’m flying over Mongolia on s7 airlines, listening to Shostakovich’s 5th symphony, having just finished the spectacular consequence, pictured below, of my Beijing airport fiasco. Do not, repeat, do not expect that a two hour layover in Beijing is enough to make the connection to Novosibirsk if you booked the legs separately and need to transfer the luggage yourself. The lost connection forced me to stay the night in Beijing (which was a treat) and fly the next day (today) to Novosibirsk, upgraded to business class. Breakfast, business class, s7 Siberian airlines. Notice the white tablecloth and cute salt/pepper shakers. Maybe this is standard for business class, but then business class isn’t standard for me. The flavours were exquisite; fresh dill on the scrambled eggs; a delicate caprese-esque salad; a curious but good chicken sausage. There was a second, dessert course as well. This was breakfast. Thank goodness it was at my jet-lag lunchtime; I don’t know that I could have downed it for breakfast. 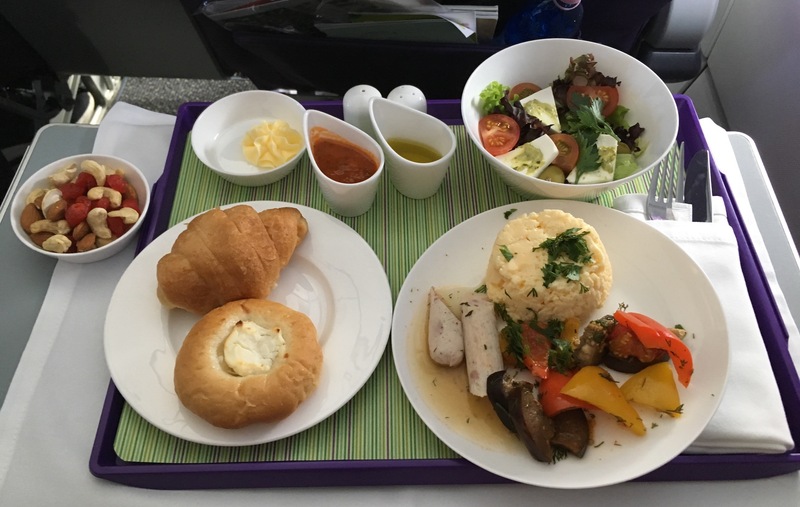 I hadn’t expected to blog about breakfasts on airplanes on my Siberian expedition, but then, experiences happen. Fieldwork is as much about the people, places, and surprises as it is about the research. s7 Siberian airlines has been a wonder, by the way, from its hip green and purple colours to its website with the best usability I’ve encountered. It feels like an airline designed by Apple (except for the green and purple). Shostakovich’s 5th is one of the few pieces of 20th century classical music I adore. Yes, it has its moments of over-the-top pomp, but there are some sublime transitions that just twist my heart. I’m listening to it for its Russianness. Getting in the mood, although Shostakovich’s mood might be a few decades out of date. I have many memories of our three day trip to Karasuk, near the Kazakhstan border, but an atypically small proportion of them are about spiders. This is partly because there were so many new experiences for me: small Russian towns, roadside кофе shops, colourful markets, the steppes, Soviet monuments, kvass, foraged mushrooms, and a new pancake recipe. Contrasts are everywhere, from Ladas and rusting Soviet machinery to Mercedes and fancy new farm equipment. But another reason that most of my memories are non-arachnological is, in fact, that there weren’t that many spiders. We’d had four species as our primary targets: one species of Asianellus for Galina, and three species of Pellenes for me. All are known to occur in the area. After the first hour on the steppes, I was worried; the habitat seemed empty. In fact, in two full days of collecting around Karasuk, we found only a single Pellenes specimen and 2 juvenile specimens of the Asianellus. I’d expected that we might be late in the season, and so perhaps the July population consisted mostly of adult females hiding with their babies. Even still, I would have expected to see more Pellenes, at least juveniles or stragglers. It was a bit spooky. But, the winter and spring were unusual climactically (the former warm but fluctuating; the latter wet and late), and so perhaps this was as an unusual year. The habitat looked just right for Pellenes. We did find some other useful jumping spiders, however, including two species of Sitticus for a chromosome and phylogeny project. We also found Phlegra fasciata, whose males are smouldering embers and females are racing-striped. Handsome, and they do move quickly. As I write this (12 July) I am in one of the most beautiful places I’ve ever been, an expansive valley full of solitude, held by ever-silent hills painted pale green and brown by the short alpine steppe vegetation. There are only a few trees, on the slope opposite me. In the distance to my right are horses silhouetted against the bright steppe valley beyond, still shadowed by the mountain behind me as the sun rises. I imagine that their ancestors might have grazed here thousands of years ago, perhaps even before being domesticated. I can see a small settlement with two yurts down-valley, near the gravel-lined river wandering through the broad valley floor. We are in the valley of the Tekelyu River north of Saylyugem Massif, near Russia’s border with Mongolia, at about 2200 m elevation. We arrived here after a heroic drive by Ivan and navigation by Galina, by roads, almost-roads, and never-roads across the countryside, fording streams and shaking ourselves up. We came here to find one of the known localities of our target jumping spider species Pellenes logunovi, near Saylyugem Massif. A bit confused about which valley to follow, we waved down a man and two children on horseback, whose words encouraged us to simply settle down in this valley. Not exactly at the target locality, but close, and we hoped the habitat would be good. 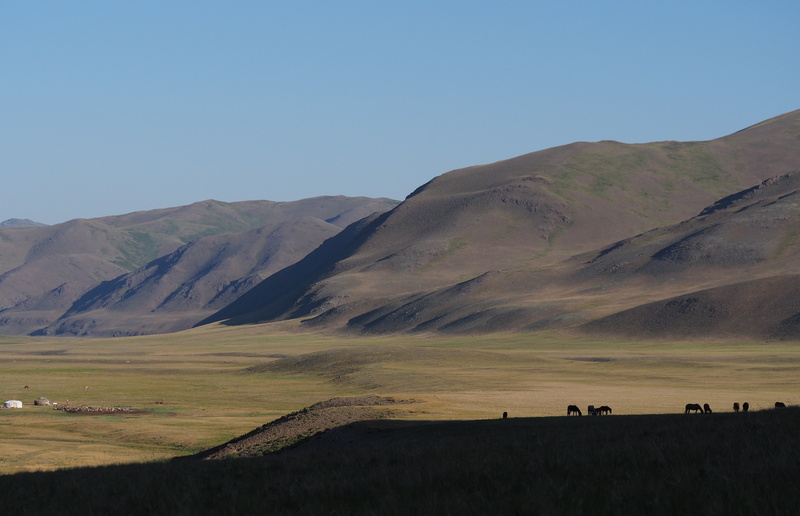 I will say more in subsequent posts about the spiders we found here, but for the moment I will soak in the sweeping hills, the steppe, the chill night air, the sheep and horses passing up and down the valley like breezes. I may enter and leave this valley quickly, like a breeze, but I’ll always remember Tekelyu. You might think that having two scientists makes discovery go twice as fast as one, that three makes it three times as fast, and so on. But, if there is a diversity of talents and inclinations, it’s far better than that. At Tekelyu Valley, our diverse eyes led us to the most important target of my trip to Siberia: Pellenes logunovi. After our chilly first night camping on the alpine steppe of Tekelyu Valley, we greeted sunrise with anticipation. Once it was warm enough to hope the spiders would be out, Galina set off in one direction, I in another, to seek Pellenes logunovi. I had a particular image of the habitat I was looking for, short bushes with patches of rock between. At a nice south-facing slope I found two male Pellenes, to my great excitement. The spiders seemed too small, but otherwise from what I could see, they might be P. logunovi. I headed back to camp and took a look at one under a microscope — no, wrong Pellenes (P. limbatus). Still important scientifically, but not my dreamed-off P. logunovi. So I set out again to a slightly different habitat. Another male Pellenes, but P. sibiricus. By this time it’s after 11:00 am and getting hot. I’m getting discouraged, because soon it will be too hot and the spiders will be taking their siestas. It seemed we might miss our chance here to find P. logunovi. And then Galina radioed — she’d found a female she thought might be P. logunovi. She was on the other side of the hill. Off I went on the long trek, and when I finally reached her, I saw that she was on a dry grassy hillside with small rocks, a rather different habitat from the ones where I’d been. She handed me the specimen and instantly I was 90% sure it was P. logunovi (and later, I confirmed it under the microscope). I was so excited. More important than anything else, she had found the type of micro-habitat that Pellenes logunovi likes. A place like Tekelyu has dozens of different types of ground — with dry grass, or green grass, or moss, or Artemesia, or rocks, or wetter soil, or on a slope, or south-facing, or near pine trees, or some combination. A spider species might prefer a precise combination for its micro-habitat. The diversity of micro-habitats at Tekelyu was too great to survey completely in the time we had, so we had to focus on some best guesses. My inclinations led me to the wrong combination; Galina’s to the right combination. On Galina’s hillside we didn’t find as many specimens as needed, but that wasn’t as important as knowing that they were at Tekelyu, and learning the habitat. If she hadn’t discovered them, we might have decided to leave that afternoon to look for another site to camp, and might have failed to find the species at all. Instead, we stayed through the afternoon and discovered that they were ridiculously common on rocks of a grassy gravel bar of the river below our camp. We now have enough specimens to do the research we want to do. The exploration phase of science depends on diverse ideas and creativity, which can unlock hidden doors to progress. Having two searchers had a compound effect on our spider gathering: it doubled our chances of finding their habitat, and once that was found, we could put double effort into gathering specimens. Because both of us could follow leads that either one of us found, our productivity as a team was well more than twice what either would achieve solo. Galina and I have made a great team for several other species as well, though those stories are for later. As I explained in a previous post, P. logunovi was my highest priority because it seems unique among Eurasian Pellenes in its similarities to the common group of species native to North America. That was judged based on pickled specimens in museums. Now, seeing them alive, I see how much they look like North American species. Here are photos, of P. logunovi at left, and the American P. longimanus at right. Pellenes logunovi from Siberia and Pellenes longimanus from Texas. We didn’t find any adult males of P. logunovi (it seems they aren’t in season), but we have many almost-adult (“subadult”) males that we will try to raise to adulthood. After only a few days, my 5 week long trip to Siberia is already a success. Pellenes peninsularis (left) and Aelurillus sp. (right) sunbathing on rocks. They don’t sunbathe on rocks to get a tan. It probably helps raise the spider’s body temperature to develop, hunt, escape and court more quickly, but it may come with the risk of heat stress, dessication and visibility to predators. Only a few evolutionary lineages of jumping spiders have braved a lifestyle on hot sunny ground. Five have done it and diversified in a big way. The sitticines of South America did it, and did it with enough success to spread all the way to Eurasia and diversify into many species there — although the Eurasian lineage has shifted to many other habitats, not just open ground. The harmochirines of Africa and Eurasia returned the favour, starting on sunny ground in the Old World before some “Pellenes” went to the Americas to diversify there as the paradise spiders, Habronattus. The peacock spiders of Australia (Maratus) similarly live on sunny ground, as do Yllenus and relatives of Eurasia, and the aelurillines of Africa and Eurasia. They are probably more heat tolerant than their relatives. At least some members of each group have unusually long jumping legs (3rd legs in the case of Pellenes and relatives; 4th legs in the case of Sitticus and Yllenus). Three of these groups bear male courtship ornaments that are spectacularly detailed and colourful (Maratus, Habronattus, and Stenaelurillus) — perhaps encouraged by easier vision in the high-light environment. Given that Galina and I both study sunny-ground lovers, it’s not surprising that we make a good collecting team. In fact, the synergy that helped us get Pellenes logunovi has worked frequently: each of us has played a key role in the others’ successes on this trip. She was the first to find Pellenes logunovi and later, P. gobiensis (more on that species in another post). I was the first to find several of her species: two Aelurillus at Kuray and an Asianellus at Kokorya. I’ve looked forward to this Siberia trip for many reasons, one of which is the chance to learn about aelurilline jumping spiders from the world expert. Aelurillines have been the primary focus of study by my host in Siberia, Galina Azarkina, for almost 20 years. In North America we see them rarely, as only one native species lives there: the striped Phlegra hentzi, whose males have a pale blue face. 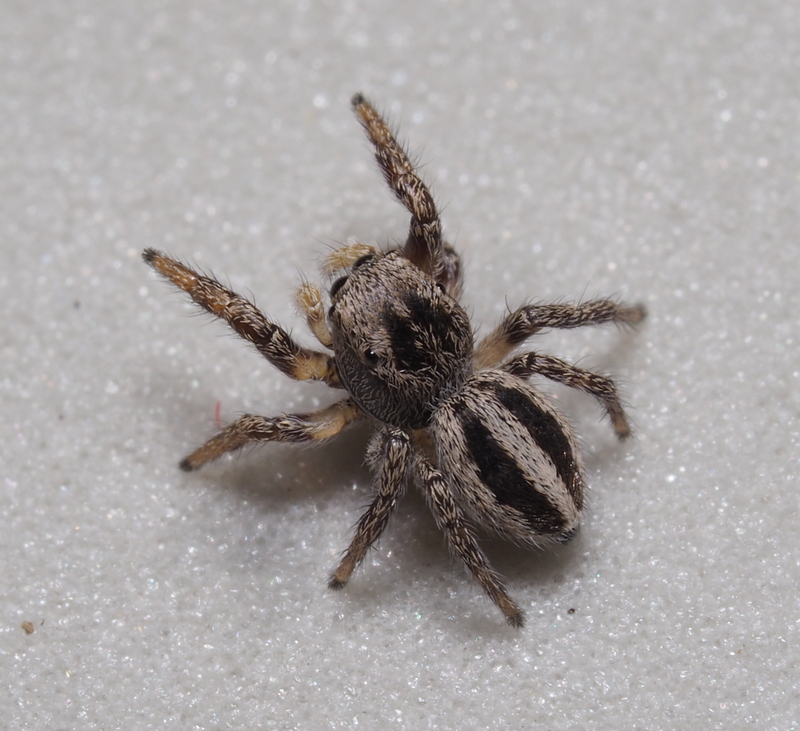 It lives alongside the much more common and diverse Habronattus, on open sunny ground with dry leaf litter. 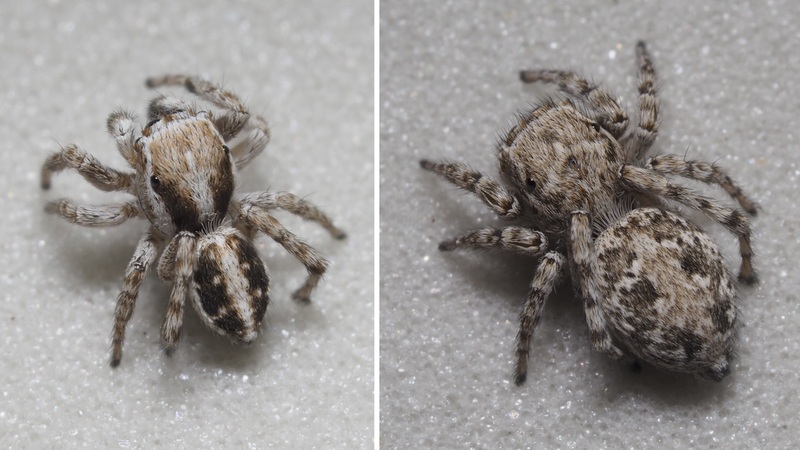 In Eurasia and Africa, however, aelurillines are diverse and common, occupying habitats very similar to those of my familiar Habronattus back home. Striped Aelurillus species from Kuray, male. I look forward to seeing more aelurilline diversity as we continue our explorations here in Siberia. Rain brings most jumping spider hunting to a halt, at least in temperate areas. Perhaps they need the sun to bring their body temperatures up for their needed activities (hunting, developing, mating); perhaps the water itself is a threat. The spiders don’t come out, and it’s awfully difficult to find them in their little retreats. I imagine them sitting by the fire drinking hot chocolate. As I write this (14 July) I am, like the spiders, sitting in my little retreat (tent) by the Buguzun river in the Altai, waiting for the rain to stop and the sun to come out. This is a good time to feed spiders. I am waiting for the mosquitoes to bite. In fact, I have my tent flaps open, to help them find me. 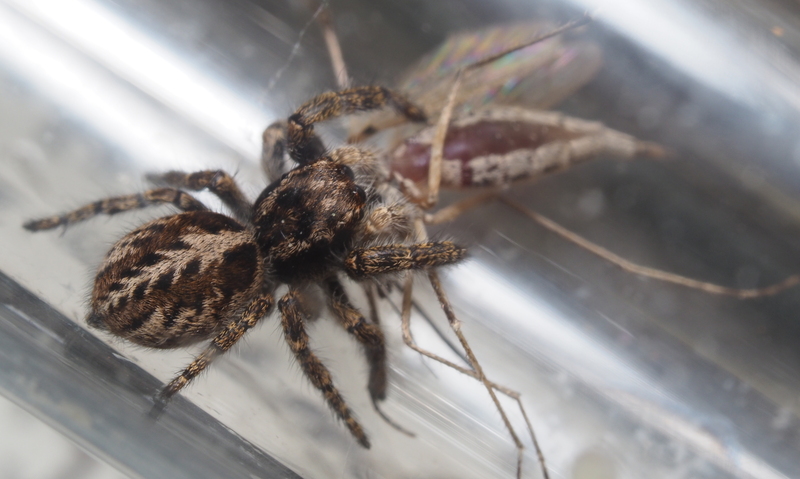 You see, I need to feed the spiders that we hope to rear to adulthood, the most important of which for me are the subadult males of Pellenes logunovi we got at Tekelyu. 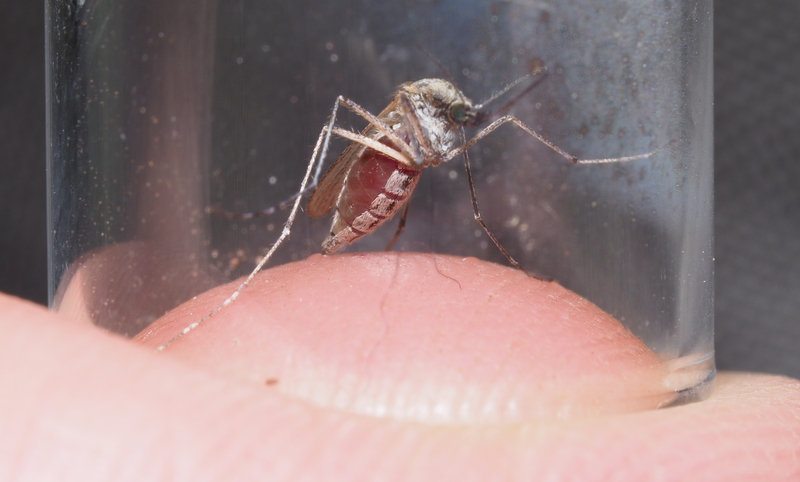 The problem is that the mosquitoes are rather skinny, and I’d like the P. logunovi to have a big meal. But, mosquitoes can be quickly fattened up from the richest source of animal material nearby, namely, me. Mosquito fat with my blood. Spider eating mosquito and me. It’s somehow pleasing to be lower on the food chain than my spiders, at least occasionally. 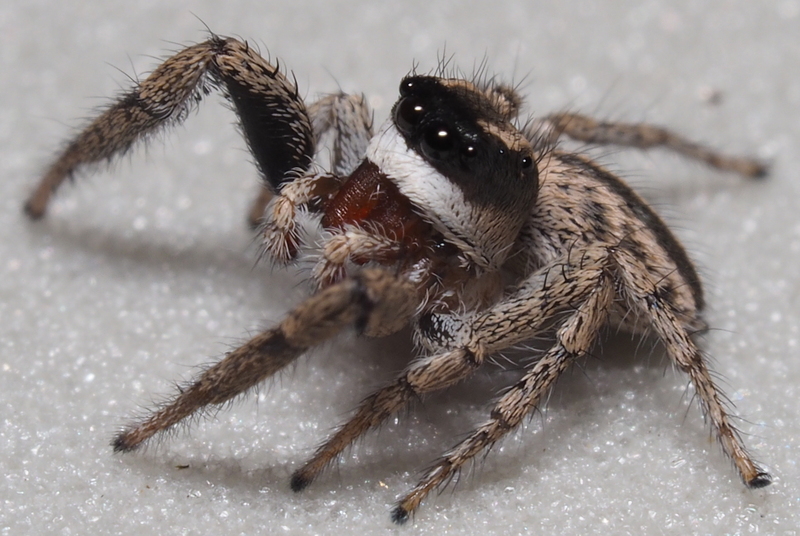 By the way, there are jumping spiders that appear naturally specialized on this sort of diet… Evarcha culicivora. 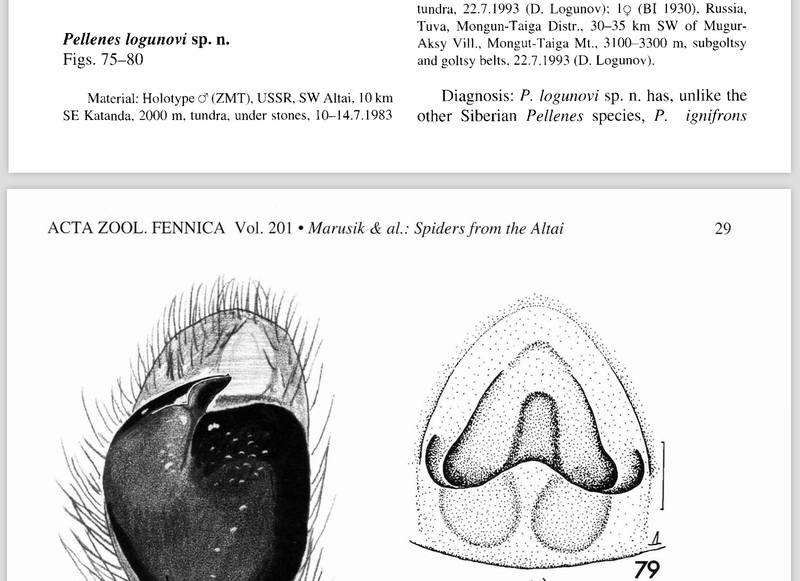 As we are driving back from the Altai toward Novosibirsk, I’m thinking about how lucky we were to have found two of my important target spider species, Pellenes gobiensis and Pellenes stepposus. In both cases what seemed like bad luck turned into good luck. Pellenes gobiensis, female. The dark markings under her eyes, “tears”, are seen in females of various other species of Pellenes and Habronattus. Here’s the twist of luck: rain not only didn’t prevent us from finding this species, but it likely helped us. Our subsequent searches turned up many specimens, but all were adult females in nests with babies. This means that they likely wouldn’t have come out onto the rocks even if it had been sunny. And, if it had been sunny, Galina and I probably would have simply walked along, scanning the ground. Not seeing anything, we might have assumed it was the wrong habitat, and not bothered to turn over rocks, which is normally a low-success activity. The rain changed that: if we were going to look, we had no choice but to take the laborious route, and it worked. In the case of Pellenes stepposus it wasn’t rain, but a delay, that led to their discovery. On the Kuray steppe we had pretty much finished our search for Pellenes and aelurillines, and were ready to move on to another site. But, one of the tasks of this expedition is to set up pitfall traps for an ecological study, and that task was taking longer than planned. I wasn’t involved in setting up the traps, but it meant I couldn’t leave yet. I looked around, exhausted, took a deep breath, and looked for something new to try. I saw some Artemesia along a stream and thought I might as well start looking on those, not expecting to find Pellenes (but perhaps some other interesting jumping spiders). Lo and behold, specimens of Pellenes stepposus started falling on my sheet. 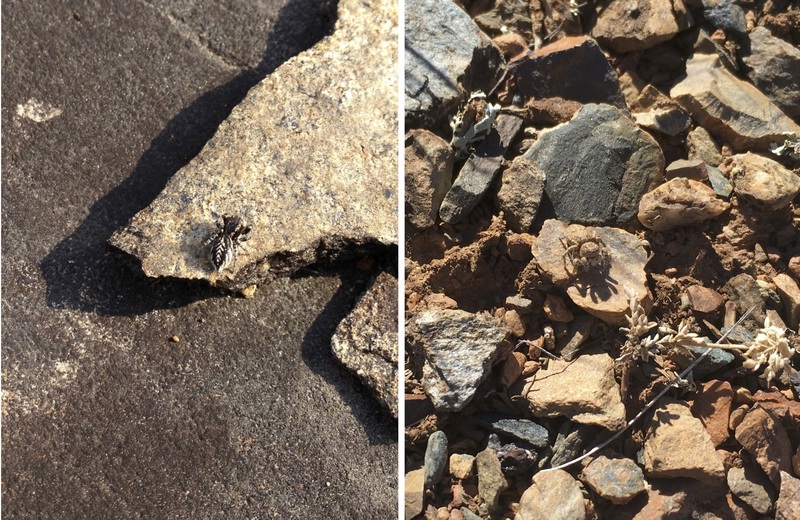 I’m back (not that you noticed I wasn’t posting), and can give you the final summary of my field work in Siberia to look for Pellenes jumping spiders: success. It was a challenge. July is past the typical breeding season, and with most males gone to the next trophic level, we were left to look for the harder-to-find females and juveniles. In the end, we found every one of our targets. I’ve already posted about our finding Pellenes logunovi, P. limbatus, and P. sibiricus, as well as P. gobiensis and P. stepposus. Those we found on the first major trip out from Novosibirsk, to the Altai. For the second major trip, to Tuva, there was one big target left: Pellenes pulcher. Pellenes pulcher, a member of a distinctive group of species important for my studies, was known from only a few specimens from Mongolia, Kazakhstan, and Russia. The only Russian locality was in the Uvs Nuur basin, a unique area of special steppes and salt lakes that is primarily in Mongolia, but just reaches north into Tuva, a republic in the Russian Federation. The precise locality from which Dmitri Logunov had collected it more than 20 years ago was right along the Mongolian border where Uvs Nuur Lake peeks into Russia. Pellenes pulcher, male, from the north shore of Uvs Nuur. As happened with P. logunovi and P. gobiensis, Galina Azarkina saved the day by finding the first female of P. pulcher, thereby figuring out that they live on the rocks of their strange steppe habitat: the tiny round woody “bushes” of Nanophyton, only a centimetre or two tall, dot the landscape, making it look like a bonsai savannah. In the end we got one male and four females. As its name suggests, P. pulcher is beautiful both in appearance (striped!) and personality (vivacious! — they hop a lot). Above is the male; here is the female and other views of the male. Notice the elegantly long first legs of the male, and his reddish jaws. Pellenes pulcher, female and male, from Tuva. And so, in the end, we got 7 species of Pellenes. Here are the other 6, in retrospect. We got only females and juveniles. Here are two females to show variation in colours. Pellenes logunovi females, from the Altai. Closely related to the well-known European P. tripunctatus, we got only a few, but both males and females. Pellenes sibiricus, female and male. We found it at Karasuk and in Tuva. We found just three, two old decrepit males, and a juvenile female. I kept the female alive, and am feeding it in hopes it will mature. Pellenes limbatus, male, from the Altai. We got only females and babies. Pellenes gobiensis, females, from the Altai. Although this is currently considered a Pellenes, I suspect this isn’t a Pellenes, but rather a Sibianor. It was common on bushes in the drier steppes. Pellenes stepposus, female and male. We found it in the Altai and Tuva. I’m not sure about the identity of this. We found four juveniles, including this one, in the Altai. They look similar to P. epularis that Galina found recently in Kazakhstan. I am trying to raise them to maturity to figure out what they are. Juvenile Pellenes, possibly P. epularis. From the Altai. My trip to Siberia was designed to find special species of Pellenes jumping spiders, but I paid attention to other species also, for my other studies of jumping spiders. One of my projects is on a group called the Sitticini, which includes species familiar on houses in some areas (e.g., Sitticus fasciger, Sittipub pubescens), as well as species in many other habitats. Sitticines originated in South America and spread into Eurasia, where they diversified into many species, and, it turns out, evolved interesting chromosomes (but that story will be for another day). 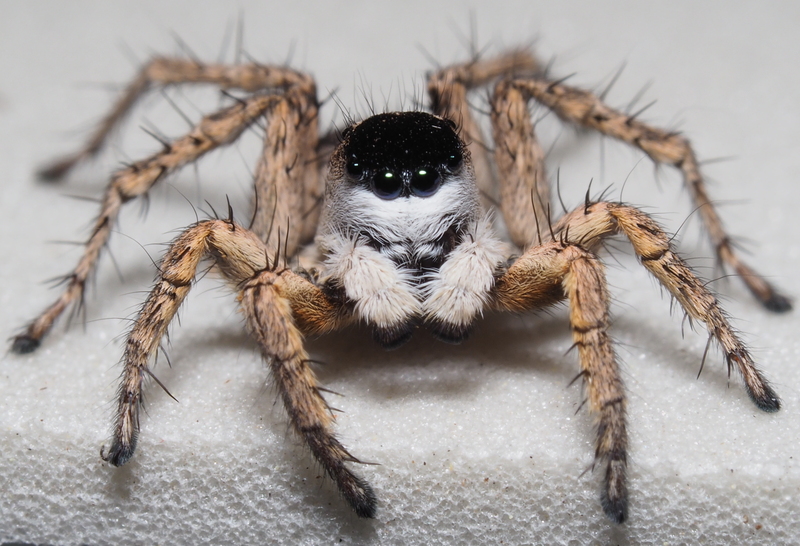 For the jumping spider geeks, here are the 7 species of sitticines we found. In each set of photos, the male is on the left, the female on the right. I’ve known this species for many years, as it was introduced into North America in the 20th century. It’s good to see it in its native continent. Attulus ammophilus, male and female, from the shores of Uvs Nuur. Very similar to A. ammophilus, but more solidly black first leg. This cute species I called “clown”. 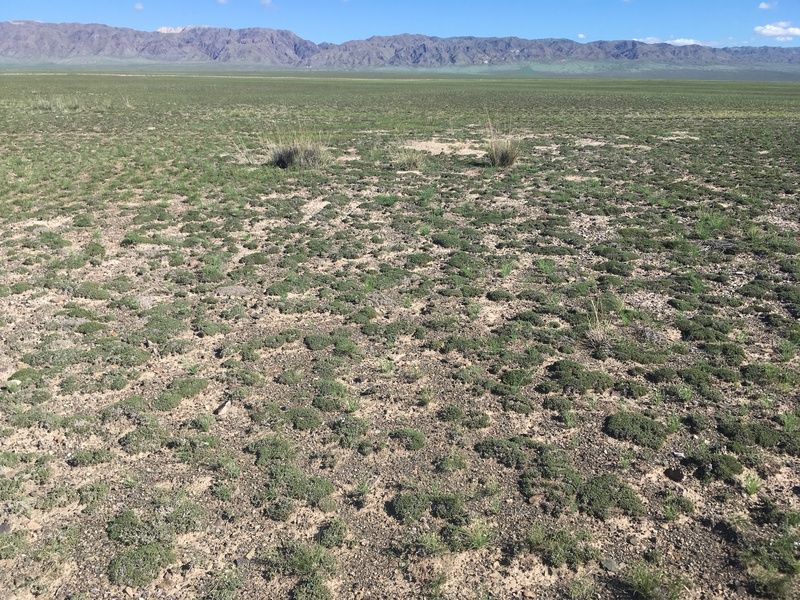 It was pretty common in isolated grass clumps in dry areas of Tuva. Attulus burjaticus, male and female, from Tuva. This is the purple-sheened guy shown above. I found just one male and one female of this marvellous species. Attulus mirandus, male and female, from the Tes-Khem River, Tuva. From the marshy shores of lakes in Tuva. Sittiflor inexpectus, male at left, from Uvs Nuur Lake. I’m haven’t confirmed that the female shown at right is the same species. A sweet little species from leaf litter and dead trees near Karasuk. Sittiflor zimmermani, male and female, from Karasuk. On buildings; taxonomically important as the type species of Sitticus. 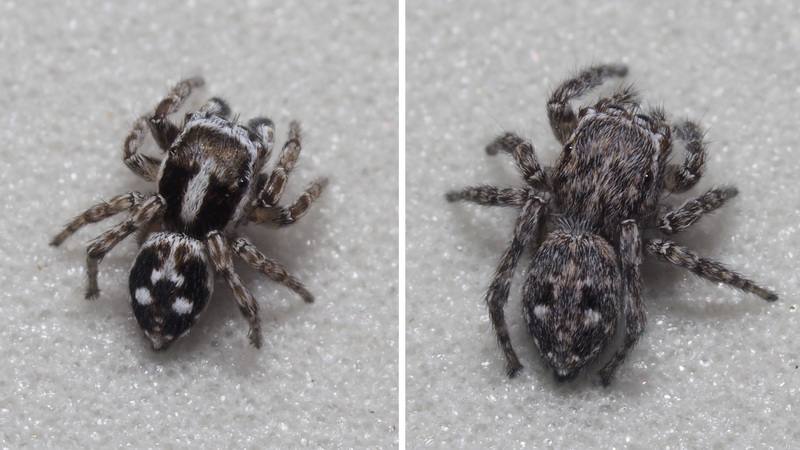 Sitticus terebratus, male and female, from Karasuk and Novosibirsk. The old adage about the value of properties depending on “location, location, location” translates to non-humans as “habitat, habitat, habitat”. When we biodiversity scientists go out into to the world studying obscure species, one of the first things we want to learn is “what habitat does it live in?”. Our search for Pellenes logunovi focused on finding the right habitat. When we finally find a species, we want to document its habitat, so that others may find it again later, and also to begin the long process of understanding its ecology. We can write simple descriptions like “on rock”, but better is to include photographs and other data. My brother religiously photographs the habitats in which he collects beetles, and I’m starting to follow his lead. Now, to document a habitat (as place and time), scientists can use a wonderful new photographic tool: 360 degree photographs in Google Street View. Here’s one at the spot where we found the nearly-mythical Pellenes pulcher. You can see details of the microhabitat (the little rocks on the ground) and macrohabitat (Nanophyton steppe along the shores of Uvs Nuur). When you contribute a 360 degree view to Google Street View, it’s as if you’ve given the viewer a little time and space machine to take them to the exact spot and time where you found an interesting species. Not exactly a street, but a Street View: habitat of Pellenes pulcher at Uvs Nuur, Tuva. The value of 360 Street Views for scientific documentation would be considerably increased by two “minor” enhancements. The first would be to have some way to attach a searchable comment: my notes about what was found there, a collecting code to link to my databases, etc. I can’t figure out any way to attach a comment. The second would be to have some assurance that the view would remain accessible on Google Maps for at least 10 years or so. That assurance, of course, seems unlikely. Even still, I’m glad to have the ability to post Street Views of a habitat, even limited as they are for now. 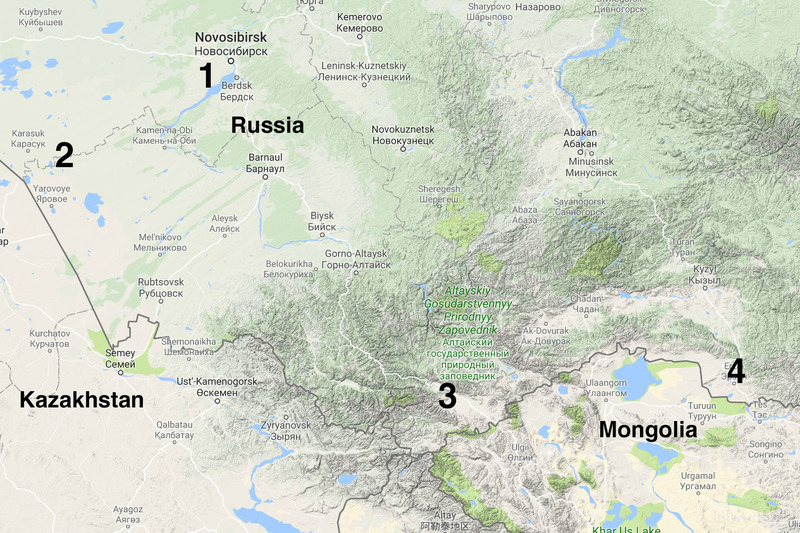 To have them listed in one public place, here are some of our spider hunting locations in southern Siberia. The codes like WPM#18-009 are my standard codes referring to a collecting place and time (which I have been using since 1975! ).